I got to New Zealand in a round-about sort of way. After my bicycle tour of eastern Cuba in January of 2012, I just knew I had to do another wintertime road adventure to escape the Toronto cold. But where? The time of the year eliminated most anything north of the equator; that left Africa, parts of Asia, and South America as possibilities. Two destinations initially caught my eye – Sri Lanka and Colombia. I even downloaded a digital copy of the most recent guidebook to Sri Lanka from the Lonely Planet website. Here is the route I figured I would follow over a seventeen-day period. To get to Colombo would involve a flight from Toronto to Abu Dhabi and then a transfer to the Sri Lankan capital. All images enlarge with a click; all blue text opens up on a new page with a click. 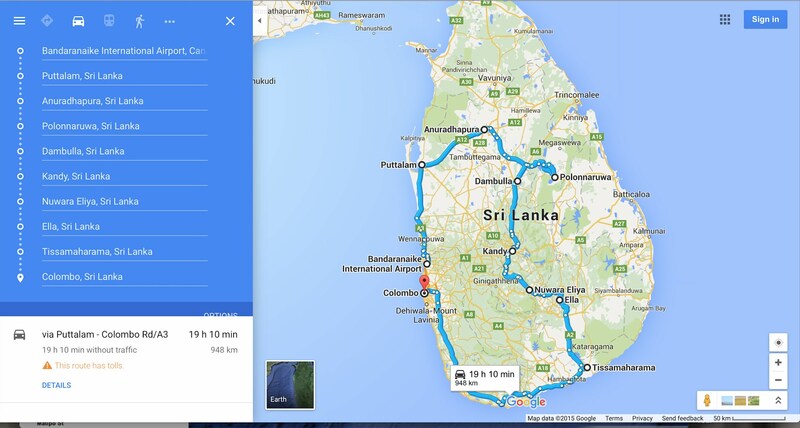 The original plan- a Three-Week Ride in Sri Lanka…with some time off to visit ancient Buddhist sites. Click here for the interactive Google map that you can zoom in on. And then a chat with a friend just returned from Sri Lanka cooled my enthusiasm somewhat. The narrow roads and crazy traffic, as well as the heat of the day, were not the ingredients of a good cycling experience. I looked around for another possibility and Colombia popped up, thanks to a package organized by a UK bike touring company, Saddle Skedaddle, that would take me from Bogotá in the Andes down to Cartagena on the shores of the Caribbean, a great 1000 kilometer ride. (The trip description is here. The link may be dead in 2015!) An advantage of Bogotá as the destination is that it is a direct flight from Toronto – only two chances for baggage handlers to screw up my boxed bike. The only problem was the cost – $3000. for 15 days, of which twelve were actual cycling days. I’m sure it would have been quite plush but I actually like planning and doing the trips on my own. Also, the thought of spending two weeks with a peloton of riders from the U.K. – being in an Anglo bubble, if you will, in a Spanish-speaking country – is not really a “plus” to me. I will admit that the security situation in Colombia is such that I don’t feel quite confident enough to do Colombia on my own. Hopefully, it will improve in the next couple of years if the government talks with FARC bear fruit. The ride from Bogotá to Cartagena looks fantastic; but then, so too does the ride along the Andean spine from Bogotá to Quito in Ecuador! New Zealand – The Right Choice! One day I googled “January bicycling tours” or some such yet again and I finally noticed New Zealand. It had been there all the while but I just hadn’t considered it. The reason: the distance, the cost, and not two but four sets of baggage handlers! Over the next two months, the Air New Zealand Toronto-Christchurch return fare dropped down from $3000. to about $2100. and I thought about it again. In the end, it was a toss-up between Sri Lanka and New Zealand. Travel time and cost of the ticket were about the same. Sri Lanka had the advantage of one less transfer; New Zealand promised a greater variety of stunning scenery and had an extensive cycling infrastructure to make the trip easy to plan. Sri Lanka offers a society infused with the Buddhist iconography that I find fascinating; New Zealand offers that comforting infusion of British colonialism that I, as a Canadian, can relate to! 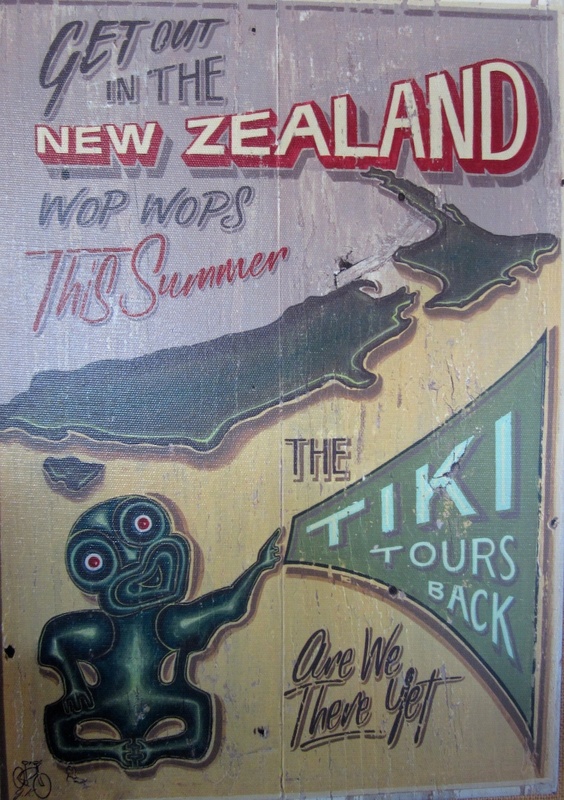 Wop Wops is Kiwi slang for the boonies – the hinterland! So there you have it; I’m going to New Zealand. The infrastructure for bicycle tourists is much more developed. The weather and temperature is also more conducive to spending six hours a day on my Brooks B-17 bike saddle. While I wanted to go in January, I’ve actually waited until the new school year begins (Feb. 7) so road traffic will be that much less of an issue. Sri Lanka’s turn may come – and Colombia is still on the back burner too. Perhaps in a couple of years, I can really make a comparison based on my experience! As I added to my embarrassingly shallow knowledge of New Zealand geography, I learned that is made up of two main islands, as seen on the map below. North Island is the one closest to the equator so it has the more tropical climate. Near the northern end is its major commercial city, Auckland. Down at the bottom of North Island is the political capital, Wellington. Located here is also the headquarters of the J.R. Tolkien empire – i.e. the Fran Walsh/Peter Jackson film company Wingnut Films. A three-hour ferry ride across Cook Strait and you’re on South Island. Only a quarter of the four and a half million Kiwis live on this more temperate (in terms of climate!) part of N.Z and of those a bit more than a third live in the Christchurch area. Running up the length of the west side of the island are the Southern Alps; a few mountain passes cross the range at various points. 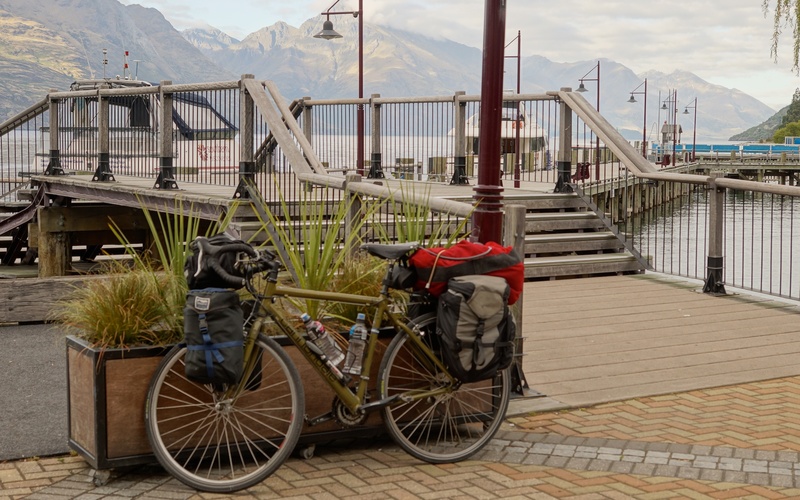 The low population, the relative isolation, and the stunning mountain and beach scenery of South Island are what bicycle tourists rave about – and they are what convinced me to focus on this part of New Zealand. Looking through my copy of that Lonely Planet Cycling New Zealand (2009) got me great information in a hurry. (The most current edition was written by a fellow Canadian who now lives in Queenstown!) There are a couple of other books recommended by N.Z. 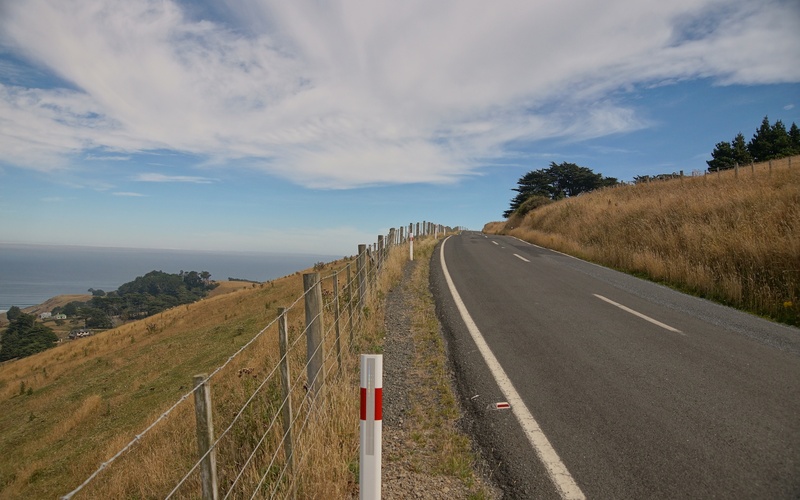 bike travellers – Classic New Zealand Road Rides (2010) by Kieran Turner & Jonathan Kennett and the Pedallers’ Paradise books (2012 is the most recent update), one on North Island and one on South Island routes. I wasn’t able to get access to them here in Toronto; I did get a copy of the Pedallers’ Paradise South Island volume in Christchurch at the start of the trip. It is the most current edition and has supposedly been updated. The 1400-kilometer tour of South Island that you see below was essentially the route I ended up taking. Click here for the “live” Google map of the route. You can zoom in to get much more detail. The #1 Question: Do I Take My Own Bike? Given that my journey to Christchurch and the start of the bike tour involved four airports (Toronto, Vancouver, Auckland, and Christchurch) and way too many baggage handlers having their turn dealing with my bike box and its contents, my biggest concern was the shape the bike would be in – if it even got to Christchurch at the same time as me. After getting a bike box from our local bike shop – and then a second one when I figured that double-boxing it might protect the bike better! – I put the boxes on a scale. The weight of the two boxes was fifteen pounds (6.8 kg)! The bike itself weighs about 14 kg. I would have to take a van/taxi to the airport at a cost of $65. and because the bike box would be the second piece of checked luggage, I would have to pay an extra $65. for that. To take my bike would end up costing $260. CDN and I would still have the worry of it getting there – and not being damaged. 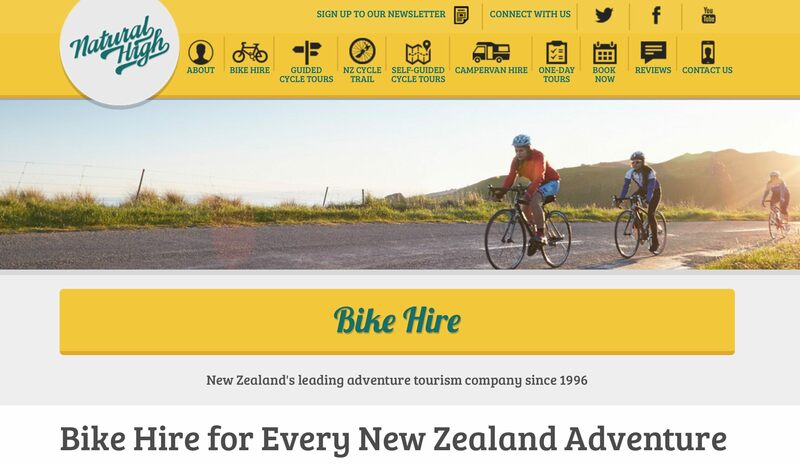 Then I came across Natural High, a New Zealand adventure tourism company which seems to do everything, including tour bike rental and tour organizing. It has storefronts in Auckland and Christchurch and a network of affiliated bike stores on both islands. Here is their deal – $515 NZ (about $450. CDN) gets me three weeks rental of a Cannondale Touring II, along with a pump and spare tube and a whole list of other things I don’t have to bring from home. So subtracting the $260. in baggage and taxi costs left me with a real cost of $190. to rent the bike once I got there. I went for the rental. I passed on the extra insurance coverage ($75.). Also possible is a transfer service that will courier baggage ahead for a reasonable price. All in all, Natural High offers a service that is difficult to beat. Natural High is one terrific company to deal with. All went as hoped for; the bike was ready and performed flawlessly for three weeks. Things went so smoothly that I did not get so much as a flat during my 1400-kilometer ride. When I reached Dunedin, I had arranged to drop the bike off at R & R Sports on Stuart Street. This too was hassle-free. I’d highly recommend this company to anyone considering the rental option; it has two depots- one in Auckland and one in Christchurch, as well as a network of bike shops across New Zealand that work with them to provide excellent service. The #2 Question: Where Will I Sleep? The biggest challenge in organizing my bike trip in eastern Cuba in January of 2011 was finding and booking accommodation. Tenting is not at all an option there so you are left with various grades of hotel accommodation or their version of b&b’s. New Zealand presents no problem whatsoever when it comes to a place to stay – pull out enough dollars and there is something for you. The tourism infrastructure is developed in a way that Cuba’s won’t be for a long time, focussed as theirs is on all-inclusive beach resorts. The first leg of my trip involves crossing the Southern Alps to Greymouth and then a 340 k. ride down the west coast. Since the weather along this stretch is unpredictable and often involves massive amounts of rain, I decided to build in some comfort and security by pre-booking rooms for the first ten nights. No matter how bad the weather is, at least I know that at the end of the day I have a room waiting. I’ll be able to dry out my clothes and gear and relax instead of putting up a micro-tent in a muddy field, all the while dodging the gazillion sand flies which everyone mentions in their trip accounts! My solution – I ended up renewing my Hostelling International membership for $38. I had used the HI hostel network for a bike trip from Vancouver through the Rockies to Calgary in 2002 and it had worked out great. It’s cheap, it’s clean, and there is a nice social vibe. The hostel staff is always has the kind of information and tips that travellers are looking for. South Island has about twenty-six Youth Hostel Association (YHA) hostels (click here for the list), many of them in towns I will be cycling through. One thing I did this time – a sure sign I am getting old(er)! – is that I specifically booked a private room in each of the hostels. While sleeping with seven strangers in the same room isn’t the end of the world, it is kind of nice to be able to shut the door and have a room all to yourself! I’ve got YHA rooms in Springfield, Arthur’s Pass Village, Greymouth, Wanaka, and two nights in Queenstown booked. I also found non-YHA places to stay (thanks to good reviews in the Frommer’s or Lonely Planet guides I looked at) in Christchurch itself, as well as Harihari, Fox Glacier Village, Haast Junction, and Makarora. The priciest room is the one at the Amore Motor Lodge in Christchurch at NZ$120. a night. However, The location is great and the room will be appreciated after my 26-hour flight from Toronto. I had tried the Dorset Street Backpackers’ but all their single rooms were taken. I ended up in private single rooms at YHA hostels or in motels for the entire stay, except for one night in my tent at the Mavora Lake campsite. I did a quick tabulation of the accommodation expenses and it came out to about $NZ1500., with the three nights at the Amore Motor Lodge on Riccarton Road in Christchurch being the most expensive at $NZ130. a night and the Mavora Lake campsite the cheapest at $NZ6. YHA rooms went for about $NZ60. and most motel accommodation (all with a kitchenette and complimentary coffee and milk) for about $100. Obviously, a solo traveller pays a premium. Do this with a partner and you will almost halve your rooming costs. Tent more often and you will bring the costs down even more. I ended up hauling 3 kilograms of camping gear for the entire trip only to use the stuff once. Not the best idea! I guess one could rationalize it by thinking of the camping gear as an insurance policy in case something went very wrong and there was no choice but to tent for the night. So much for the nitty-gritty of organizing the trip; check out the following posts if you want the details on the actual trip, along with some images to give you an idea of the roads you’d be riding over and the scenery that will often insist that you stop and take in the beauty which is New Zealand’s South Island. 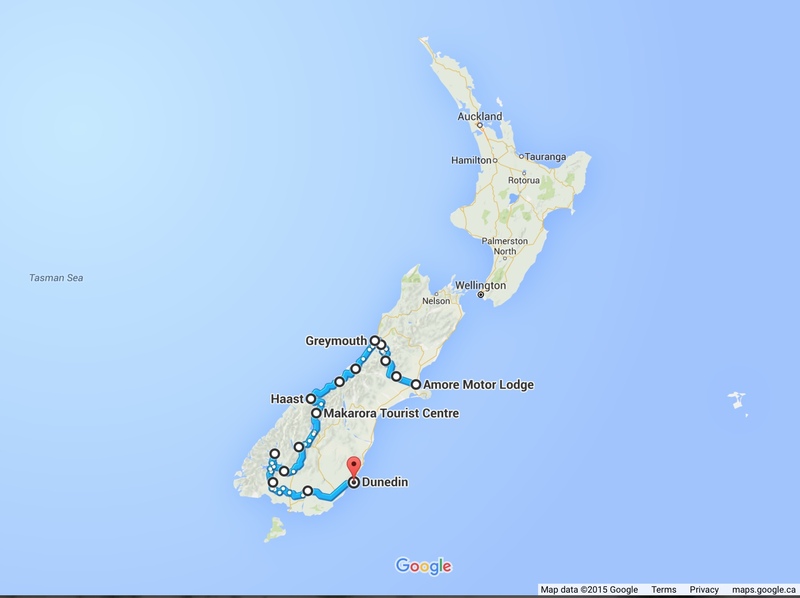 Part 6: The Mavora Lakes to Te Anau And On To Invercargill and Dunedin! This entry was posted in bicycle touring and tagged bike rental New Zealand, bike tour of New Zealand, cycling christchurch, cycling from christchurch to springfield, cycling from springfield to grey mouth, Natural High bike rental review, new zealand south island cycling route, renting a bicycle in New Zealand, Southern Alps bike tour, why bicycle New Zealand, why bicycle South Island New Zealand. Bookmark the permalink. Really a very beautiful log embracing both the physical challange and the personal desire (soul?) to touch the Earth intimately. Logistical information was spot – on and was of great assistance in planning my voyage/pilgrimage but even greater was the keening heart for the open road. I hope this abundance will always infuse you,even if it means the day-to-day trivial becomes somewhat baffling. I am so glad I took a read to this post and will refer to it often as I prepare for my trip/pilgrimage to the Peloponnese. You responded in a very thougthful fashion which renewed my belief in the internet as a community builder and charged my bravado. I think Greece is similiar to your ride . . . if you can get to a hamlet/village/town with some euros in your saddle bag you will have a place to stay. I also am keen on your suggestion of trying some touring/camping from my front door – Texas may not be beautiful but it is striking with an abundance of open space for (clandestine) camping. Well, again, thank you for the post; this trip to Greece means so very much to me and your response to my Lonely Planet question was exceedingly more than I expected. Michael, enjoy the Greek bike ride/pilgrimage on two wheels when it comes – and in the meanwhile see things differently by pretending you’re a tourist in your home town of Austin, a city that gets rave reviews from friends of mine here in Toronto! As for Ελλάδα – it’s only my list too.